Democratic presidential candidates Bernie Sanders and Hillary Clinton are actively pursuing the votes of black Democratic caucus and primary voters in Nevada and the key Southern state of South Carolina. Both candidates, for example, showed up at Victory Missionary Baptist Church in Las Vegas over the weekend, and Clinton on Tuesday speaks at the Schomburg Center for Research in Black Culture in New York, outlining her plan for helping black families. Sanders appears Tuesday at Morehouse College, a historically black university in Atlanta. Black voters are crucial for Clinton, given that she has a relative image problem among white Democrats. Sanders has a relative image problem among black Democrats nationwide, although some of that is based on the fact that about a third of them do not know him. Sanders, although born in New York City, has lived in Vermont since the late 1960s, and as an elected official from that state has not dealt with many black voters or black constituents. That's because 1.2% of Vermont residents are black -- giving the state the third-lowest proportion of blacks in the nation, ahead of only Montana and Idaho. In New Hampshire, whose Democratic primary Sanders won, blacks constitute 1.5% of the population. And in Iowa, where he came in a close second to Clinton, 3.3% of the population is black. On the other hand, the states that loom ahead on the Democratic primary and caucus calendar are more diverse. Nevada's population is 9% black, and South Carolina's is 28%. And, of course, because blacks largely identify as Democrats, primaries and caucuses in those states will have even higher percentages of black voters. In 2008, for example, exit polls showed that over half of the voters in the South Carolina Democratic primary were black. The two Democratic candidates are also competing for Hispanic voters. This is particularly relevant in Nevada, where Hispanics make up a little less than 28% of the population, although less so in South Carolina, where Hispanics are 5% of the population. Sanders actually has an image advantage over Clinton among Hispanic Democrats in some ways, although he is again deeply handicapped by his lack of name recognition. Here are the basic data showing how non-Hispanic whites, non-Hispanic blacks and Hispanics nationwide evaluated Clinton and Sanders over the past month. Clearly Clinton has a very positive image among blacks, with 82% favorable and 12% unfavorable ratings, leaving only 6% of black Democrats nationwide who don't have an opinion of her. Sanders' image among blacks, on the other hand, comes in at 53% favorable and 16% unfavorable, with 31% who don't have an opinion. It is important to note that Sanders has a higher basic unfavorable rating than Clinton among black Democrats. When I reduce the base only to blacks who have an opinion, Clinton's image is 87% favorable/13% unfavorable, while Sanders' is 77%/23%. In other words, everything else being equal, if black Democrats who now don't have an opinion get to know the candidates and form opinions similar to those of Democrats who already know them, Clinton's image would be considerably more positive than Sanders' -- with a net favorable of +74, compared with +54 for Sanders. This is a clear Clinton advantage. But Clinton operates at a deficit among both white Democrats and Hispanic Democrats. White Democrats' views of Sanders are significantly more positive than their views of Clinton -- any way you look at it. Clinton's 28% unfavorable rating among this group is much larger than Sanders' 13%. Sanders is better known among whites than among blacks, so when we extrapolate the numbers on the base of those who have an opinion about the candidate, we don't find them greatly changed. But Clinton comes in at 71% favorable/29% unfavorable, while Sanders comes in at 85%/15%. That's a net favorable among white Democrats who know her of +42 for Clinton and a very strong +70 for Sanders among white Democrats who know him. Based on our latest figures, whites constitute 57% of Democrats and independents who lean Democratic in their political orientation, by far Democrats' largest racial or ethnic group. Blacks constitute about 22% of Democrats, while Hispanics make up 16%. Sanders is better liked than Clinton among Hispanic Democrats, but he has a major name identification problem. Only 8% of Hispanic Democrats don't know enough about Clinton to have an opinion, while almost half -- 46% -- don't know enough about Sanders. The bad news for Clinton is that 21% of Hispanic Democrats have an unfavorable view of her. Only 7% of Hispanic Democrats have an unfavorable opinion of Sanders. So, when we recalculate just on the base of those with an opinion of the two, Clinton comes in at 77% favorable/23% unfavorable, while Sanders comes in at 87%/13%. That's a net favorable of +54 for Clinton and +74 for Sanders. In other words, Sanders is better liked by the Hispanics who know him than Clinton is among the Hispanics who know her. Of course, Clinton has been a public and widely known figure among blacks and Hispanics since she became first lady in 1993, while Sanders is just coming into national prominence. If and when Sanders becomes better known, he may acquire more negative baggage -- sometimes an inevitable part of political campaigning. So his unfavorables could go up. But at the moment, the bottom line is that Clinton has a significant image problem compared with Sanders among Hispanic Democrats and, particularly, white Democrats, while Sanders' main challenge regarding these groups is to become better known. 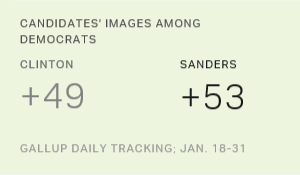 Clinton continues to enjoy a better image than Sanders among black Democrats nationwide. Although politically very different, presidential candidates Ted Cruz and Bernie Sanders have both campaigned on the same contention that government in Washington is not working, something largely in tune with Americans' attitudes. Long the underdog candidate in the Democratic presidential nomination contest, Democratic adults who know Bernie Sanders now like him better than Hillary Clinton. 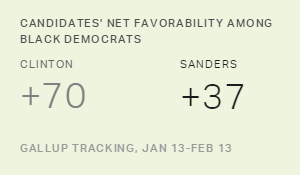 Sanders has a net favorable score of +53, compared with Clinton's +49. Democrats are becoming more positive in their views of Bernie Sanders and more negative about Hillary Clinton. The images of Ted Cruz and Donald Trump are slipping among Republicans.